We can now add Cover Model to the list of accomplishments that Steve Spangler has achieved. 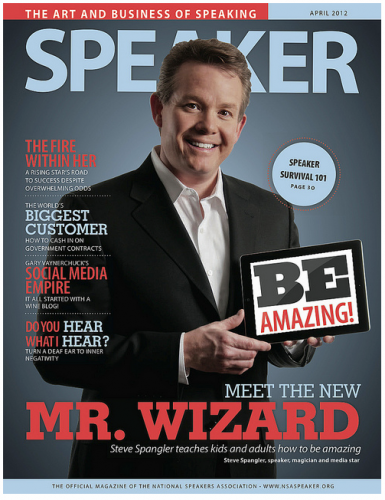 He is on the cover of Speaker Magazine this month as The New Mr. Wizard. Steve has been a member of the National Speaker Association for years and has been a keynote speaker at its conferences. The article chronicles Steve’s rise to success from performing at church and birthday party events on the weekends with his parents, to doing over 4,500 school assemblies, to toy designer and teacher trainer. Magic and speaking have always been an important part of Steve’s life and career. Pick up a copy of Speaker Magazine and find out how he turned a few videos on a fledgling website called YouTube into a paid gig on their new network. Another interesting fact about Steve – he knows how to surround himself with talent. Our own Shawn Campbell took the photo for the cover. Great article Steve. You are an asset to the speaking biz! WOW STEVE THATS GREAT !!!! !